Then 4 is houses. 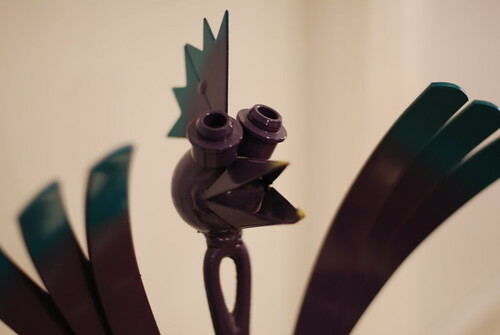 If you have no idea what I’m talking about, finish reading my post and then come back up and follow this link to a marvelous madcap blog where you can read about Beyonce the Giant Metal Chicken and learning to pick your battles. Still with me? Okay: first things first. Secondly…I attended the marvelous Agents of Change conference today, and while an excellent evening of paying culinary homage to the fourth anniversary of being married to John has been helpful in unwinding, I’m still processing. It gave me great inspiration for both my professional work and my personal projects. For now, I’ll just say that (1) good things are coming for Variations on a String and also my novel-level work and (2) once I set up a newsletter sign-up, you should jump right on that list because it will only ever bring you interesting things that NO ONE ELSE WILL BE GETTING. So keep your eyes open. Alright, I’m done with you. Go back to the top of the post and check out the giant metal chicken thing…it’ll exercise your liver.